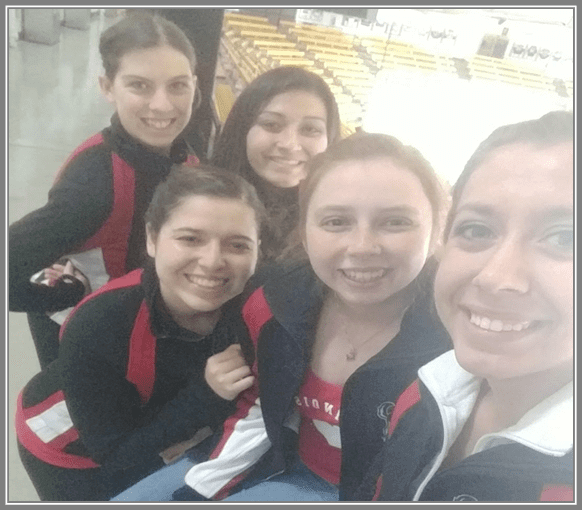 Last November, NIU Figure Skating took to the ice once again for the 2018 Bronco Challenge Cup sanctioned by the United States Figure Skating Association and hosted by Western Michigan University. The competition included 20 university teams competing in short programs, ice dances, free dances, free skates and team maneuver events. From the veteran competitors to the beginning skaters who were not quite ready to compete yet, everyone had something to gain from the competition. For the new skaters, it gave a sense of community and belonging. “I think it is really nice that we have a supportive environment where our new team members feel invited to go to competitions with us, even if they do not feel quite ready to be competitors yet. It allows them to be part of the team and practice with us, yet there’s no pressure to compete if they do not want to,” says Stephanie Knoth, a junior accounting major and three-year member of the team. For the veteran skaters, it is a sense of support and learning. The competition started out rough with a fall in novice ice dance resulting in a last place finish and two falls in the senior short program event, resulting in a second-to-last place finish. However, after winning a bronze medal in the team maneuvers event, the tides for NIU Figure Skating began to turn. “It was a learning experience. Sometimes in life, you fall and have to get back up. I had to get back up for the team event. I was not going to let my team down. This was a learning experience in that I had to learn how to maintain my confidence in a time of vulnerability, and I feel so thankful that I had such supportive team members to guide me along in that growing up time,” says NIU Figure Skating President Ashley Grazutis, a senior middle level teaching and learning and Spanish languages and literatures double major. The competition ended for NIU Figure Skating with a clean Senior Free Dance and a clean Senior Free Skate. The team is looking forward to competing in its next competition on Saturday, Feb. 9, and Sunday, Feb. 10, at the University of Minnesota, Twin Cities. If you would like to learn more information about the team or would like to join, please contact Ashley Grazutis at agrazutis@niu.edu.